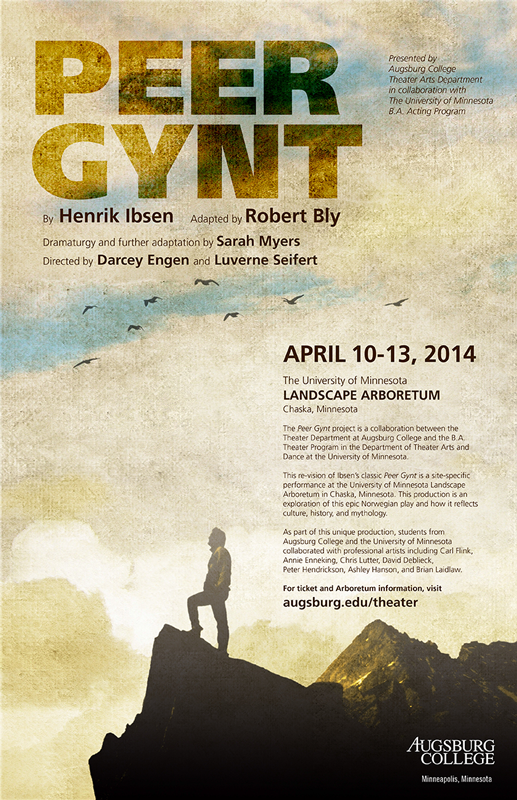 The Peer Gynt Project is a collaboration between the Theater Department at Augsburg College and the BA Theater Program in the Department of Theater Arts and Dance at the University of Minnesota. This re-vision of Ibsen’s classic Peer Gynt is a site-specific performance at the University of Minnesota Arboretum in Chaska, Minnesota. This production is an exploration of this epic Norwegian play and how it reflects culture, history and mythology. Students from each department will work closely with the project leaders, Darcey Engen, Chair and Associate Professor of Theater at Augsburg College and Luverne Seifert, Instructor and Head of BA Theater Performance at the University of Minnesota to create a highly innovative, condensed, site-specific production that explores the universal themes in the play. April 12 12 p.m., 3 p.m., and 6 p.m.
April 13 12 p.m. and 3 p.m. Peer Gynt will be performed outside with the audience journeying along side the performance on foot. There will also be some first come first serve seats on a small electric vehicle for those with mobility concerns. There are no tickets to see the performances. The $12 arboretum entrance fee paid at the entrance gate the day of each performance will allow you to see the show as well as enjoy all the arboretum has to offer. No reservations needed. All those inside the Arboretum visitor center at the time of each show are welcome to attend and follow the show. Please try to arrive at the arboretum fifteen minutes prior to your selected performance time. The play begins at the Berens Cabin. Feel free to refer to the arboretum map in the visitor center and proceed to the cabin or wait to be escorted by members of the cast. The audience will be gathering prior to each show in the main reception area of the Arboretum Visitor Center. For those who arrive late, there will be signs guiding you to the show’s route or ask at the information desk for directions to the first scene. On April 12 there will be two audience buses departing from the Augsburg College campus in Minneapolis to The Minnesota Landscape Arboretum. The seats on each of the buses may be reserved via the Augsburg Theater Box Office. The $7 general public bus ticket will serve as the arboretum entrance fee and show admission. Augsburg and University of Minnesota students ride free, but need to make a reservation. Saturday, April 12 is the only day buses will be provided for travel to The Arboretum from Augsburg College. There is a 1:30 p.m. bus departing for the 3 p.m. show and at 4:30 bus departing for the 6 p.m. show. There is no bus departing for the 12 p.m. show. Parking Map: The Augsburg parking permits issued via the box office are for Lot L. If you reserve a seat on one of the two April 12 buses, you may park in Lot L.
Each bus will return from the arboretum to Augsburg College 30 minutes following the performance. Buses will depart from in front of the arboretum visitor center. You must return on the bus you traveled to the arboretum on to guarantee a return seat. For additional information, please contact the Box Office at 612-330-1257. As you support our production, please consider donating nonperishable food items to Campus Cupboard, Augsburg’s food shelf supporting students with need. More information at inside.augsburg.edu/foodshelf.